For this flight with Thai Lion Air I had very low expectations. As with any low-cost carrier, I expected it to be a case of you get what you pay for. Having paid less than $100AUD/$72USD for this flight I expected unpolished service, on board an older aircraft on a flight that was probably going to be delayed. How I was wrong, Thai Lion Air really impressed me. I was keen to try Thai Lion Air after seeing their A330 premium economy seat was a lie-flat bed and was operated on the short Phuket to Bangkok (DMK) route. I went through the motions on their website to book this flight however at the payment screen my credit card was rejected. I tried several times with no luck – I then found out that their online booking system wouldn’t accept certain foreign credit cards with online forums full of similar experiences. I then searched for the flight on Skyscanner – initially searching for premium economy seats, which strangely didn’t return any results. It wasn’t until I changed my search criteria to business class that the flight appeared. Finally, SUCCESS! I used an online travel agent to book the flight and paid slightly more than the direct website price doing so. I received my confirmation number and was able to use the Thai Lion Air app to select my preferred seat. I was unable to check-in using their app so made my way to the check-in desk at Phuket’s domestic terminal. There is no priority lane for premium economy customers and check-in was a first come first severed operation. This was not a problem on this occasion however most premium economy products do offer this, and it was disappointing that this was not included in the fare. 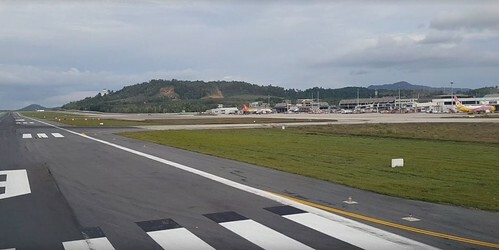 There is no lounge access with Thai Lion Air however there is a pay to use lounge at Phuket’s domestic terminal called the Coral Executive Lounge. I gave this lounge a miss and decided to get a cheap Thai massage in the terminal before departure instead. This is where the service went from meeting my LCC expectations to surpassing them. Boarding was announced to be starting shortly. So natural, I along with the rest of the passengers started to move toward the departure gate and queue up. There was no designated premium economy queue (similar to check-in) so I joined the general boarding queue. While in the queue, the check-in counter staff member grabbed me out of the line and escorted me to the front to be loaded on first. I declined the preferential treatment at first, but she was insistent that I follow her to the front of the queue and board first, I obliged. I was then escorted by the same crew member down the aerobridge and handed over to a cabin supervisor who showed me to my seat after welcoming me by name. While getting settled in the cabin crew member went and got a pre-departure bottle of water for me before taking the time to show me the seat and IFE system. This level of service was not expected at all and was on par with some of the big South East Asian carriers. Low cost carriers are notoriously late, not the case on this flight. Push back occurred precisely on time. We taxied from the gate directly to the runway passing by people on the beach waiting to see this A330 take-off and feel the jet blast from this widebody. 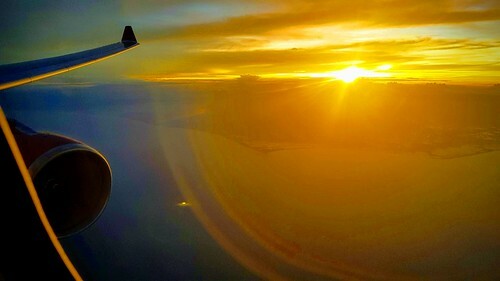 The flight time from Phuket to Bangkok (DMK) was just short of 1 hour. I was lucky enough to be the only person in the premium economy cabin for this flight which was fantastic, making it feel like my own private A330. Such a thrill. 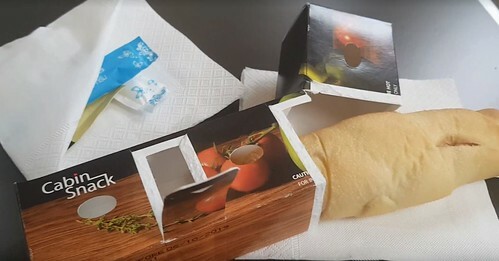 Being such a short flight, the cabin crew immediately came around during our climb to our cursing altitude with the snack meal service. The snack served was a warmed ham and cheese pocket roll and was fairly tasty. They came around several times during the flight offering more bottled water and cleaning rubbish away as required. They were so friendly and passionate about their work. They genuinely wanted to engage in conversation and were interested in what had bought you to be flying with them on this flight. I stood out amongst the other passengers on the flight being a six-foot tall Australian. The staff were exceptional, and service was on point, comparable to the big full-service carriers in the region. The in-flight entertainment system was excellent. The seat back has a 11-inch touch screen with heaps of movies and TV shows to suit a global audience. There is also the option to play games on the IFE using the controller located in the arm rest. Heaps of entertainment for this short flight and would be sufficient for their longer range flights as well. The seats in the premium economy cabin are in a 2-2-2 configuration and are designed to recline into an (almost) lie flat bed. 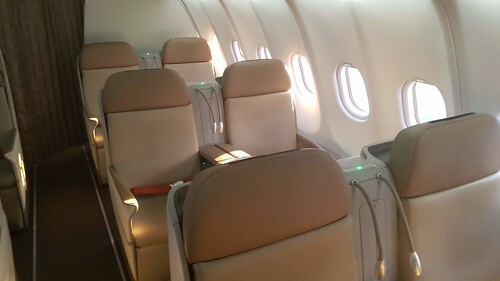 The seat pitch is 60 inches with a width of 25.5 – similar to what is found on Thai Airways older configuration on their 777-200/300’s business class. After an enjoyable, relaxing and exceptional flight it was time to make our approach into Bangkok - Don Mueang International Airport. This airport is the one of two international airports in Bangkok (the other being Bangkok’s main airport Suvarnabhumi). DMK is predominantly used by LCC like Thai Lion Air, Air Asia and Scoot. Arrival into this airport was smooth and without need to be in a holding pattern prior to touch down. One of the highlights of this airport is the Kantarat Golf Course that is located between the two runways. This was my first time at DMK airport and it seemed better organised than BKK. Getting from the flight through to the taxi area was quick and easy. The taxi area was well organised – there is a waiting room where you collect a ticket and wait to be called over to the counter to meet your taxi driver. The best way to summaries this flight was surprising. I booked this flight a week before the tragic events of Lion Air flight 610 in Indonesia. I contemplated cancelling my booking however was glad I decided to stick with the carrier and try Thai Lion Air’s A330-300. This was my first experience with Thai Lion Air and first time flying with a LCC in Thailand. I was surprised with the level of service and quality of their product considering the coast. A flight of a similar length on a LCC in Australia (Sydney to Melbourne) in economy can cost more than $100AUD without baggage or food. If you didn’t want the premium economy experience with Thai Lion Air, you can get an economy seat on this flight without food or baggage for as low as $37. Don’t get me wrong, this is my one and only experience on their flagship brand new A330 on a short flight. I have read the horror stories online of other people’s experiences with Thai Lion Air and Lion Air on-board their 737 variances but after this flight I would still be willing to give them a go. I would highly recommend this flight for anyone needing to travel the short distance between Phuket and Bangkok or their other destinations serviced by the A330 in China. I would love to hear about others experiences with Thai Lion Air and see if other people have had a similar positive experiences or if mine was just a one off. Nice report! I rather enjoyed my flights on Thai Lion as well. Next time I plan on booking the Premium Economy after seeing your report. Looks fantastic for the price. Those J seats looks like the J hard product offered by TK/ET.